TO ACTIVATE IMMEDIATELY: On the donation thank you page, you will see a blue button that says “Click here to activate your THIRTEEN Passport access.” Click the button and follow the on-screen instructions to get started with THIRTEEN Passport immediately. OR TO ACTIVATE LATER: If you choose not to activate Passport immediately after donating, you can activate later using a code sent to the email address submitted on the donation form. The email will be from THIRTEEN Station Partners (partners@thirteen.org) Follow the instructions in this email to complete the activation process. LOCATE OR REQUEST ACTIVATION CODE – If you donated through an online form, you may have received an email with activation instructions immediately after making your donation. 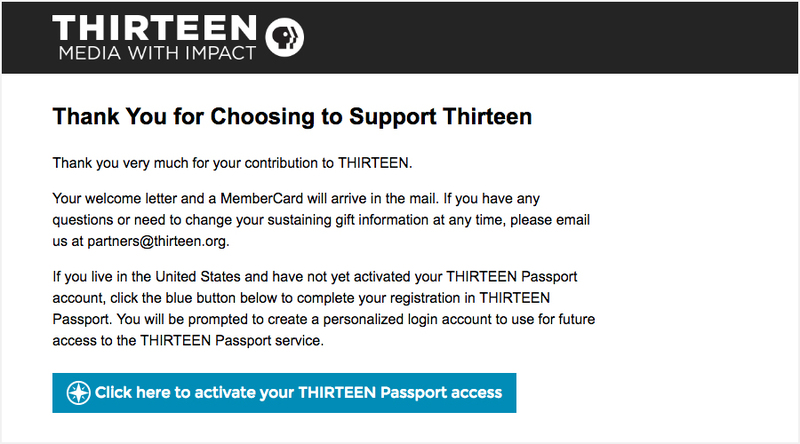 Please be sure to check your SPAM folders for an email from THIRTEEN Passport (membership@thirteen.org) containing your activation code and instructions. If you did not receive an email, cannot find the email, or are missing your activation code, you can look up your THIRTEEN Passport activation code by filling out this form. PLEASE NOTE: If you made a donation within the last 3-5 business days, your information may not be in our member database yet and won’t be found using this form. 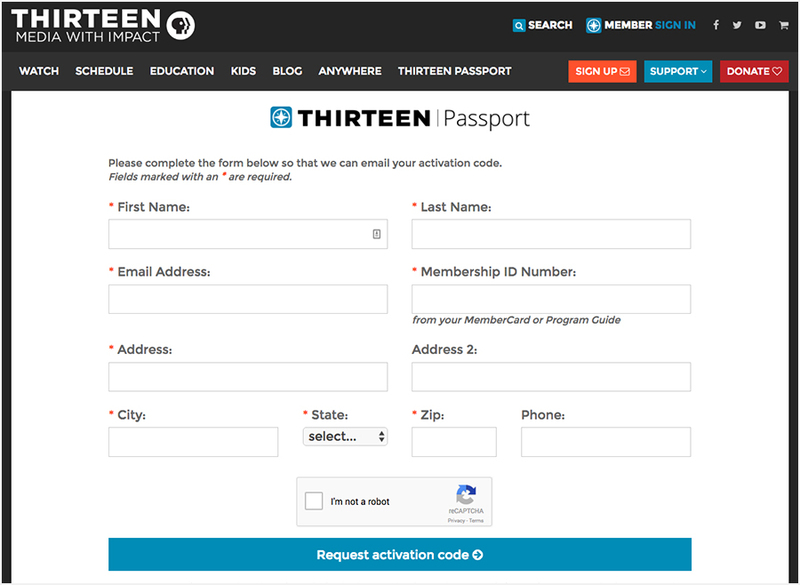 ENTER ACTIVATION CODE – After filling out the form and clicking “request activation code,” you should soon receive an e-mail from THIRTEEN Passport (membership@thirteen.org) with further information. If you don’t see the email after a few minutes, be sure to check your SPAM folder. Once you have received your activation code via email, follow the instructions in the email or enter the code here. SIGN IN – You will then be prompted to chose a sign in method. You can select Google, Facebook, or your PBS Account. 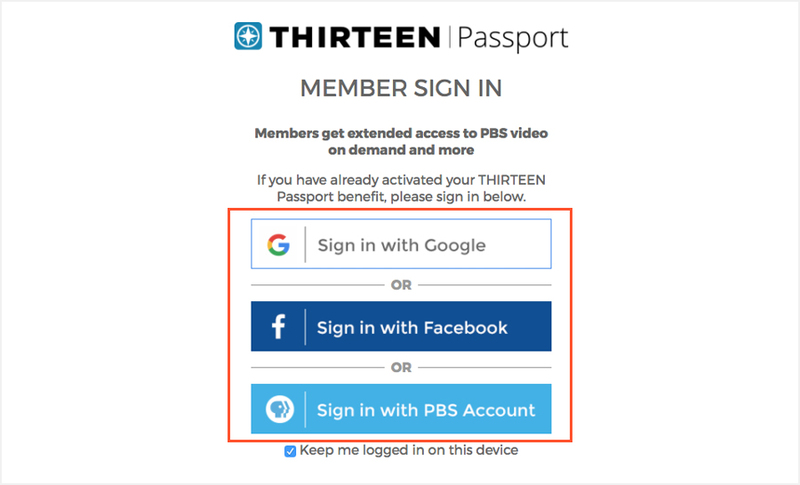 If you do not want to connect your Facebook or Google accounts to THIRTEEN Passport, the PBS Account option allows you to create a log in with your email address. This will be the method you use every time you sign in to enjoy members-only content. ACCEPT TERMS – Review and accept our terms. You must accept the terms to access THIRTEEN PASSPORT. For more information, visit PBS Help. After you accept these terms, you can enjoy your new member benefit.